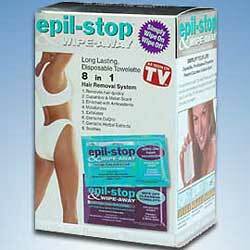 New to the Epil Stop Family - Epil-Stop & Wipe-Away, pre moistened hair removal cloth towelettes. Simply wipe on hair removal formula infused in the cloth, leave on approximately 6-7 minutes and wipe away with Wipe-Off towelette. Each disposable cloth towelette contains Vitamin C and E, so its gentle to your skin. Now Epil-Stop has simplified your life. These Wipe-On/Wipe-Off towelettes can be used on the arms, back, chest, and legs. The Safer, Faster Way To Hair-Free Skin! Co Q10 is an antioxidant that occurs naturally in your skin to help protect against aging. The skin needs anti-oxidants to protect the surface from damaging environmental radicals found in smog, smoke and other chemicals in the air. As we grow older, Co Q10 diminishes and wrinkles start to appear, This unique formula helps bring back that soft, smooth, youthful look again. Also contains Vitamin F - natures work horse, soothing Aloe Vera, calming Chamomile and Willowherb which is known to help with irritation.